Check out the NEW fragrance Downtown by Calvin Klein. Love the sweet and simple bottle design. 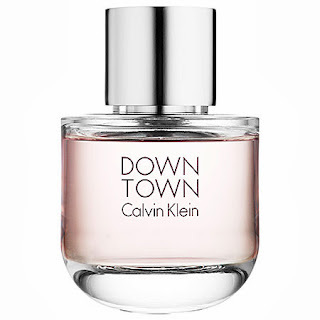 The new Calvin Klein Downtown eau de parfum is sophisticated and extremely feminine, yet has a confident edge that sets it apart from the rest of the portfolio. Hailed as, “a signature classic for a real woman, sophisticated, distinct and unique…with attitude,” this fragrance empowers with a classic brightness. Opening notes of Italian cedrat, bergamot, and neroli Tunisia orpur, mingle comfortably together with nuances of fresh green pear and dewy watery plum. The journey continues with a contrast of pink peppercorn dusted over violet leaf and gardenia petals, enhancing the sense of feminine sophistication. Finally, the unmistakable signature of sensuality and attitude are brought to life with texan cedarwood, touches of incense, vetiver, benzoin laos orpur, and warm velvet musks, leaving behind a statement of confidence.